Wild: The first marsupial I’ve encountered on the island is the Procoptodon vivencurrus. Standing nearly three meters tall, it is also the largest jumping creature I’ve ever heard of. It is a fairly peaceful herbivore that only fiercely attacks if aggressed upon. Domesticated: Procoptodon’s dry pouch makes it an excellent beast of burden that can carry far more than other creatures of its size. But more importantly, many tribes use it as a two-seater transport by having a secondary rider nest in the pouch. Since this passenger doesn’t have to worry about controlling the Procoptodon, the pouch-warrior can focus on firing his or her weapons. 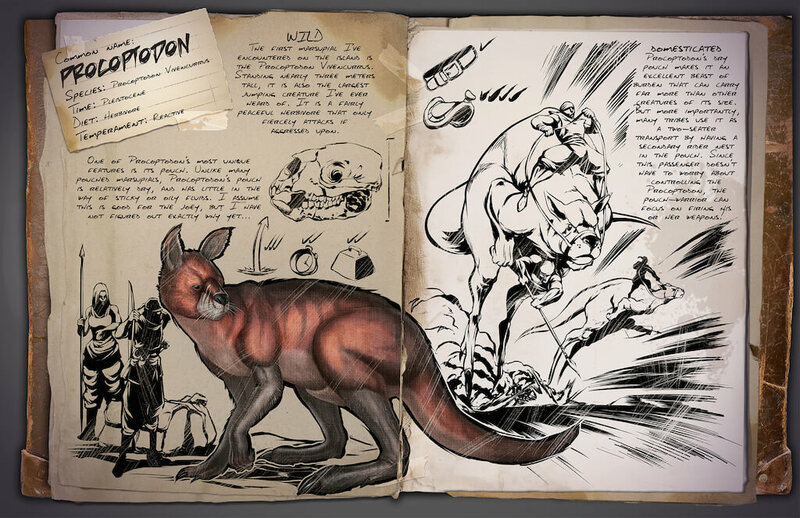 According to the dossier, it will be possible to carry another player in the pouch of the Procoptodon. This player can then even use his or her weapons, meaning that a co-op dino-riding is just around the corner! What will you use this feature for when the dinosaur is released? Shooting other people in PvP, use it for tranquilizing other dinos, or anything else? Leave a reply in the comments to show your ideas!